This is more a climate report than a weather report; yet, the extreme weather that did hit the U.K. recently and that is forecast to hit large parts of North America next week may make more people realize that action is needed now. So, please share! 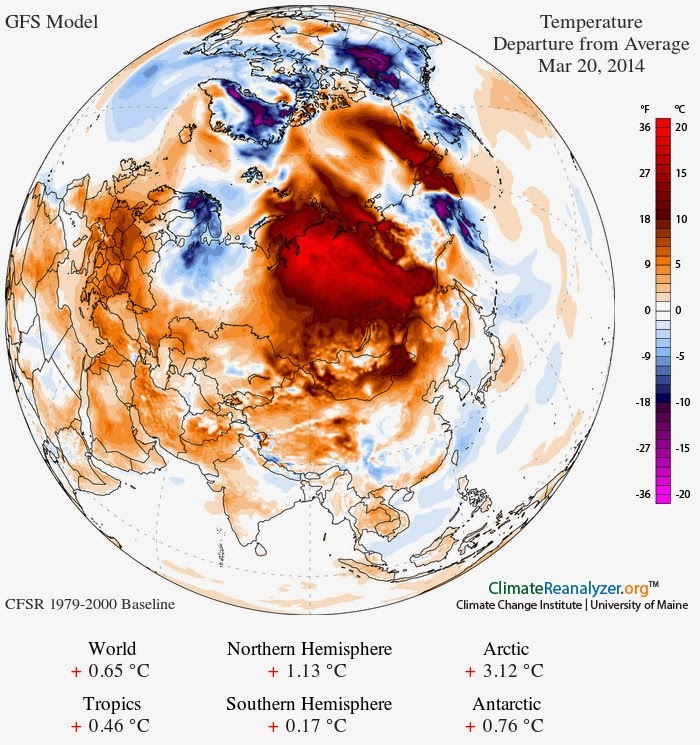 At the moment, a large part of Russia is experiencing temperature anomalies at the highest end of the scale, i.e. more than 36°F (20°C) warmer than average past records. Above image shows the situation as at March 20, 2014. The image below is a forecast for March 22, 2014. Over the past year, average temperatures over the Arctic Ocean have been much higher than they used to be, as illustrated by the NOAA image below. Warming in the Arctic is accelerating, in part due to a number of feedbacks such as extreme weather. 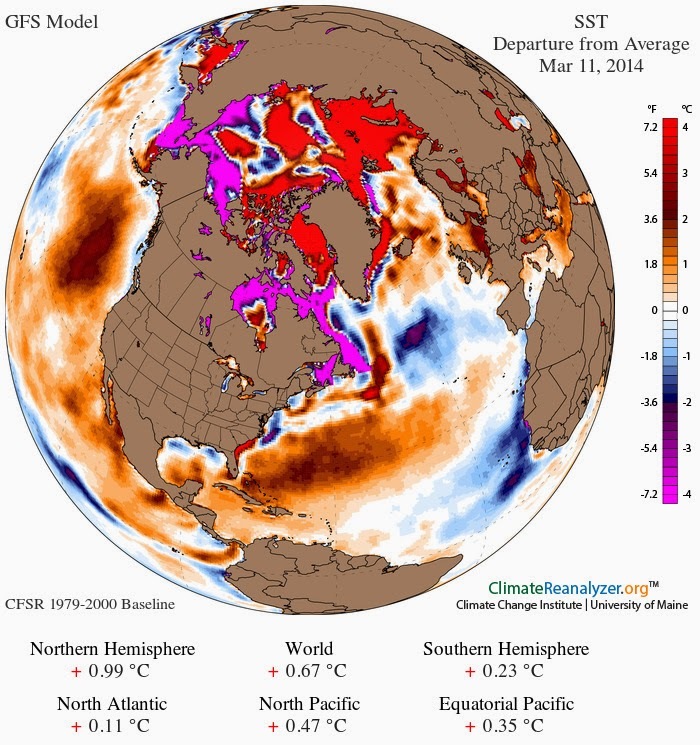 Temperatures over the Arctic Ocean are expected to rise even further next week. The Arctic as a whole is expected to reach average anomalies as high as 5.3°C next week, while many areas over the Arctic Ocean are expected to be hit by even higher anomalies, as the image below shows. Above image also shows that, at the same time, very low temperatures - with anomalies at the low end of the scale - are expected to hit a large part of North America. 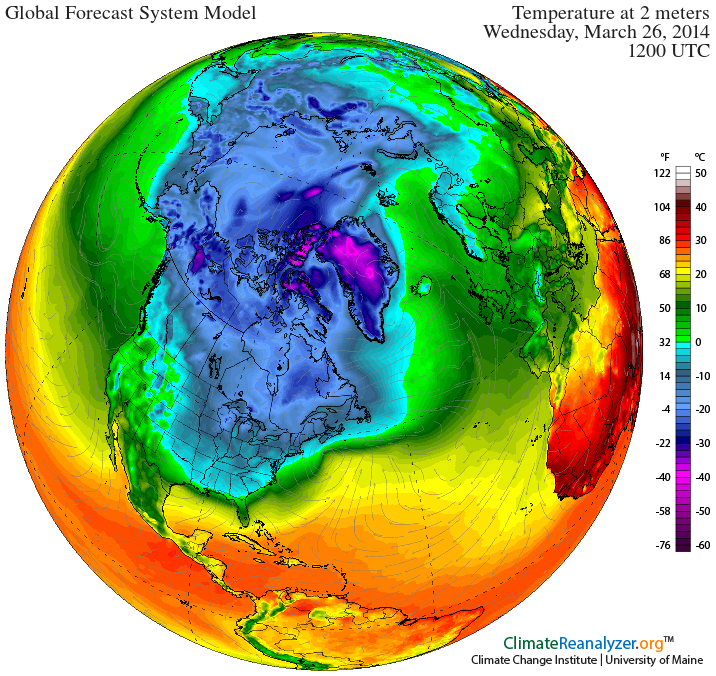 The image below shows what temperatures can be expected on March 26, 2014, 12:00 UTC. As above image illustrates, temperatures over a large part of North America can be expected to be hardly higher than temperatures over the Arctic Ocean mid next week. It is this very difference between high altitude temperatures and lower altitude temperatures that drives the Jet Stream. In the absence of much difference, changes to the Jet Stream are making it easier for cold air to move out of the Arctic and for warm air from lower latitudes to move in. 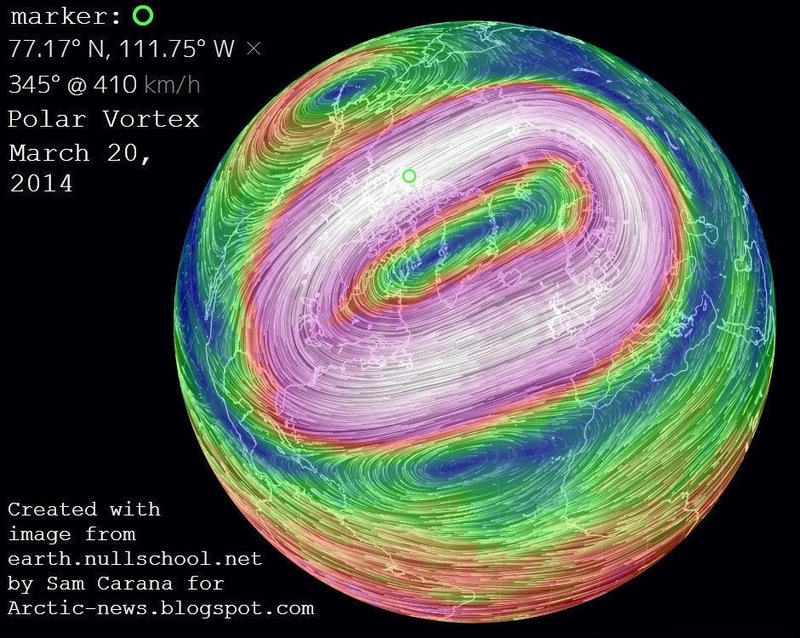 The Polar Vortex is similarly affected, as illustrated by the image below. At lower altitude, the highest wind speed detected on the image below was 94 km/h (green marker). 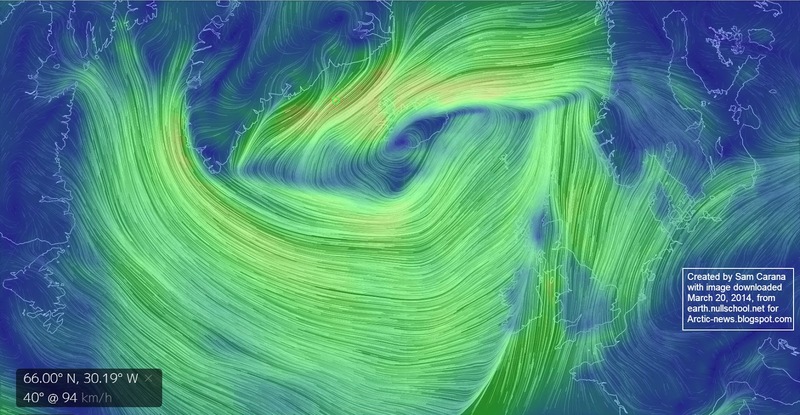 Strong winds brought a lot of rain from the Atlantic Ocean to the U.K., as has been the case for some time. The result is more extreme weather, which can translate into more intense storms, heatwaves, droughts, wildfires and further havoc. Importantly, storms across the Arctic Ocean and higher wind speeds along the edges of Greenland can break up the ice and speed up its exit from the Arctic Ocean. The Naval Research Laboratory animation below shows strong winds pushing the sea ice around and speeding up its exit along the edges of Greenland. Despite the cold weather that has hit large parts of North America over the past few months, the water off the coast of North America has not cooled, as illustrated by the image below. The blue and lilac colored areas are in part the result of exit currents carrying cold water out of the Arctic Ocean more rapidly, while the Gulf Stream continues to carry warmer water (brown and red colored areas) into the Arctic Ocean. 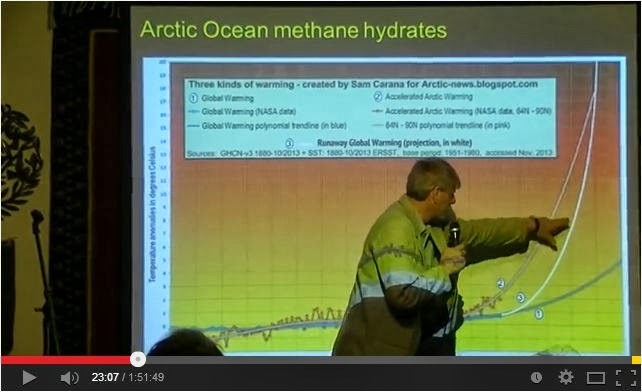 - Methane is present in large quantities under the seafloor of the Arctic Ocean. These circumstances and the combined impact of feedbacks such as extreme weather make that, on top of global warming, the Arctic is hit by a second, addtional kind of warming, i.e. 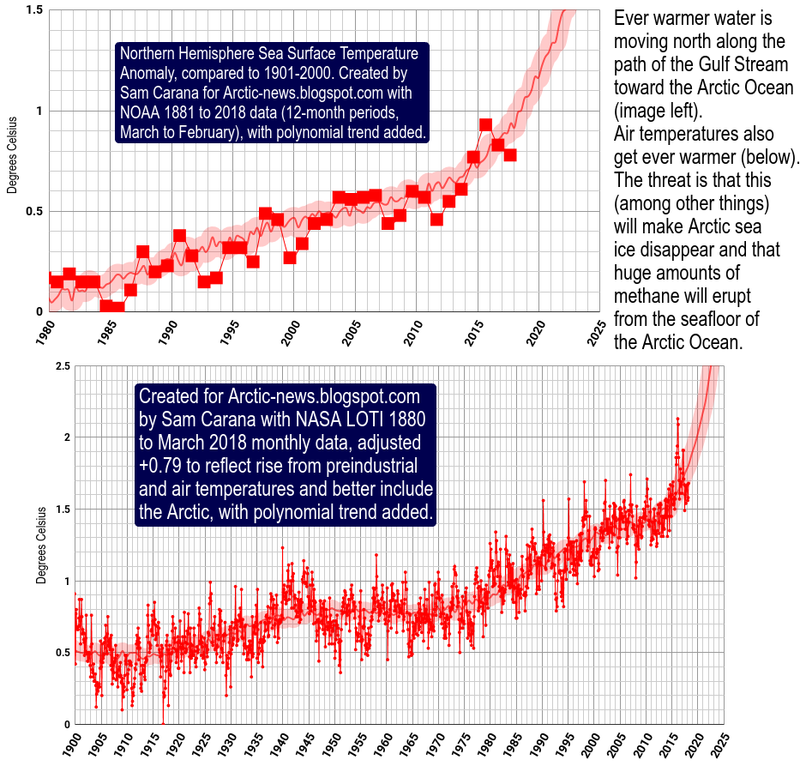 accelerating warming in the Arctic. The joint impact of feedbacks is becoming stronger, as temperatures keep rising in the Arctic and with continued demise of the snow and ice cover. So, let's start with feedback #1, i.e. that, as snow and ice cover decline further, an ever larger part of the sunlight will be absorbed by the Arctic Ocean, rather than to (a) be reflected back into space or (b) be consumed in the process of transforming ice into water. This first feedback will then be amplified by further feedbacks such as storms that can more easily develop in open water. And, as the weather becomes more extreme, stronger storms and heatwaves can be expected to hit the Arctic Ocean, causing further demise of the sea ice, resulting in more heat being absorbed by the Arctic Ocean. Thus, feedbacks can amplify each other, causing warming in the Arctic to accelerate even further. One of the most dangerous feedbacks is that, as the Arctic Ocean warms up further and as the Gulf Stream carries ever warmer water into the Arctic Ocean, methane can erupt from the seafloor of the Arctic Ocean in large quantities. 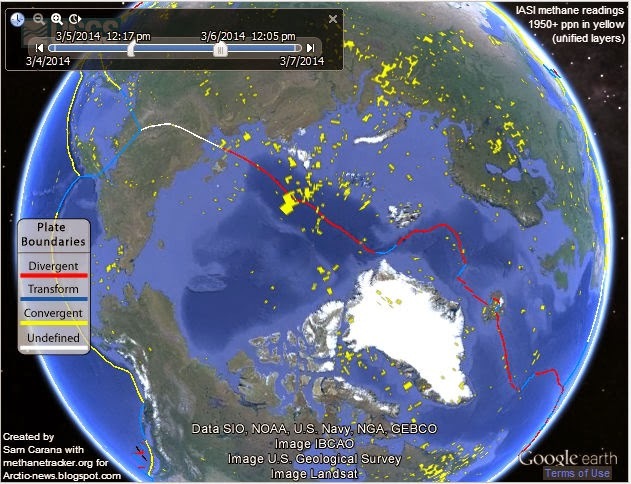 Methane eruptions from the seafloor of the Arctic Ocean have become especially noticable over the past half year. The big danger is that this will develop into a third kind of warming, runaway global warming. 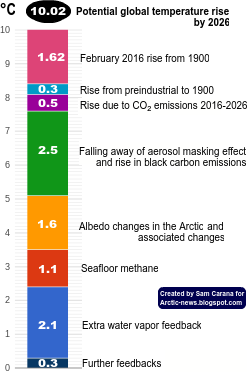 Large amounts of methane are still entering the atmosphere over the Arctic Ocean, which contains very little hydroxyl to start with, so large abrupt releases will deplete the little hydroxyl that is there much faster than elsewhere. Furthermore, the methane will initially be highly concentrated in the atmosphere over the Arctic Ocean, and where the methane does move out of the Arctic, it could warm up the water along the track of the Gulf Stream, causing even warmer water to enter the Arctic Ocean. For years after its release, the methane will act as a powerful greenhouse gas. Unlike the albedo changes, which have the highest impact at the June Solstice when the amount of solar radiation received by the Arctic is higher than anywhere else on Earth, methane prevents heat from radiating out into space throughout the year. 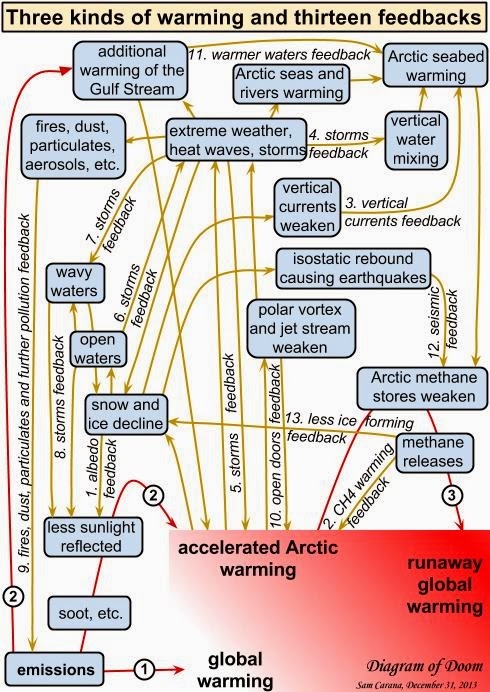 The interactive diagram below gives an overview of these three kinds of warming and the numerous feedbacks that are accelerating warming in the Arctic, from the earlier post The Biggest Story of 2013. In conclusion, the situation is dire and calls for comprehensive and effective action, as described at the Climate Plan blog. 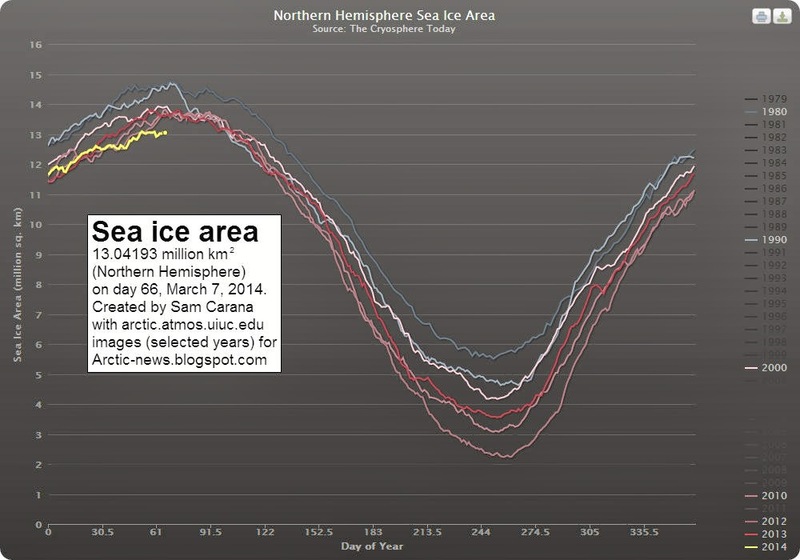 On March 9, 2014, Arctic sea ice area was at a record low for the time of the year, at only 12.88731 square kilometers. 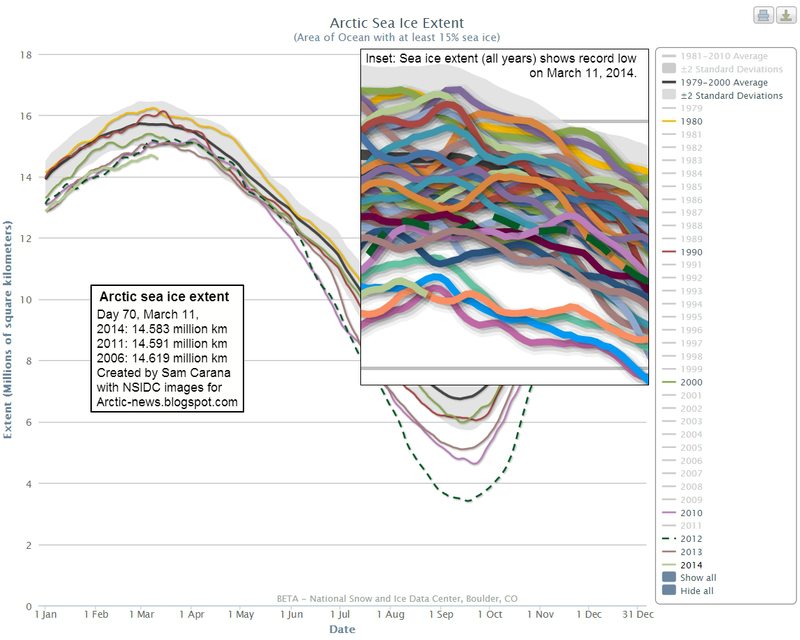 Sea ice extent shows a similar descent, as illustrated by the NSIDC image below. NSIDC update: The image below shows that Arctic sea ice extent was 14.583 square kilometers on March 11, 2014 (light green line), a record low for this time of the year and smaller than it was in 2006 (magenta line) and 2011 (orange line) at this time of the year. The situation is dire, given that methane concentrations have risen strongly following an earthquake that hit the Gakkel Ridge on March 6, 2014, as illustrated by the image below. 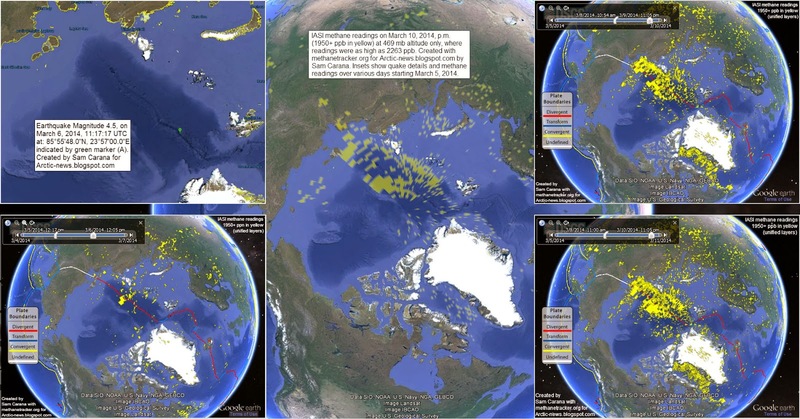 Huge amounts of methane have been released from the seafloor of the Arctic Ocean over the past half year, and the resulting high methane concentrations over the Arctic will contribute to local temperature rises. 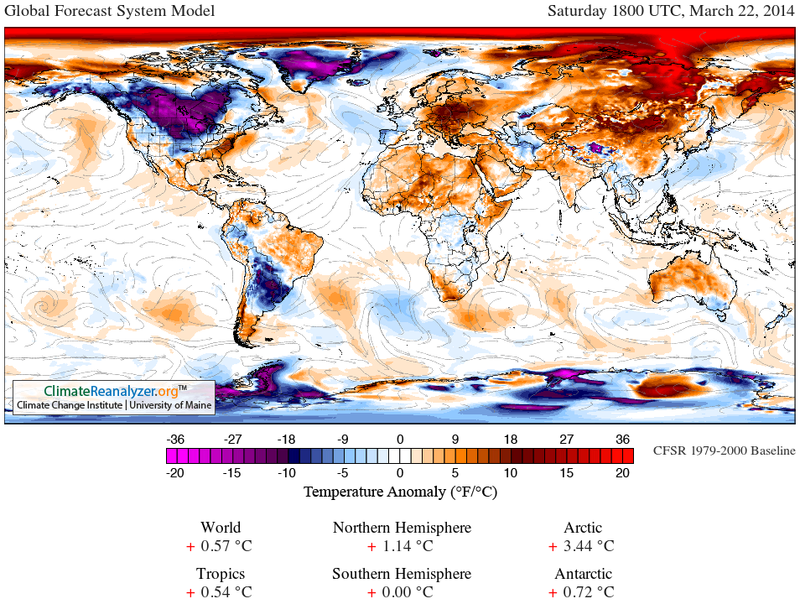 The image below shows that sea surface temperatures are anomalously high in the Arctic Ocean and off the east coast of North America, from where warm water is carried by the Gulf Stream into the Arctic Ocean. The prospect of an El Niño event makes the situation even more dire. NOAA recently issued an El Niño Watch. This follows a conclusion by an international research team that found a 75% likelyhood of an El Niño event in late 2014. The consequences of sea ice collapse would be devastating, as all the heat that previously went into transforming ice into water will be asbsorbed by even darker water, from where less sunlight will be reflected back into space. The danger is that further warming of the Arctic Ocean will trigger massive methane releases is unacceptable and calls for comprehensive and effective action as discussed at the Climate Plan blog. 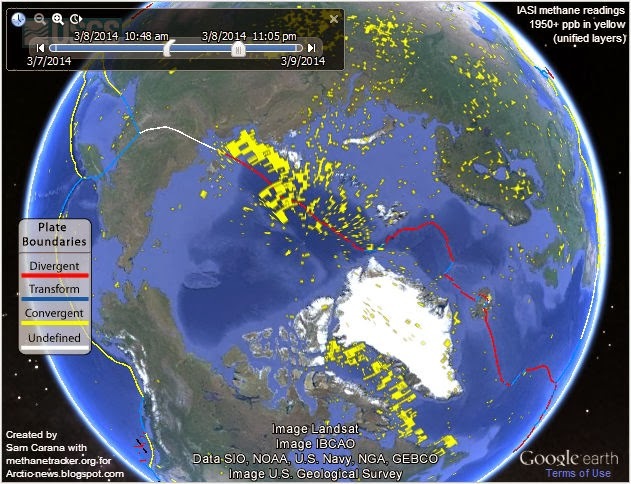 The above image shows recent large methane release over the Gakkel Ridge, the faultline that crosses the Arctic Ocean between the northern tip of Greenland and the Laptev Sea (red line on map). Methane readings were as high as 2395 ppb at 586 mb, an altitude that often shows high methane readings originating from the Arctic Ocean. 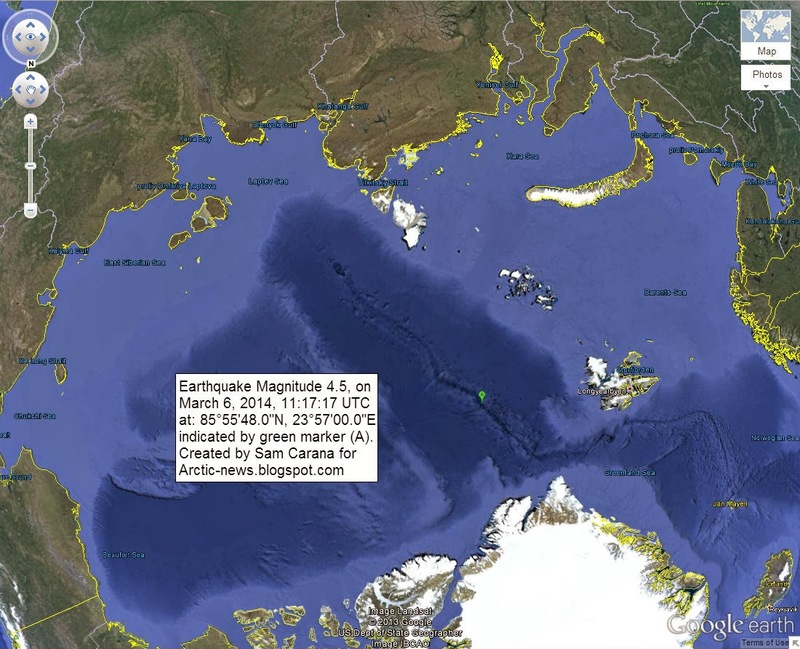 An earthquake with a magnitude of 4.5 hit the Gakkel Ridge at a depth of 2 km on March 6, 2014, at 11:17.17.0 UTC. The location is shown on the map below. 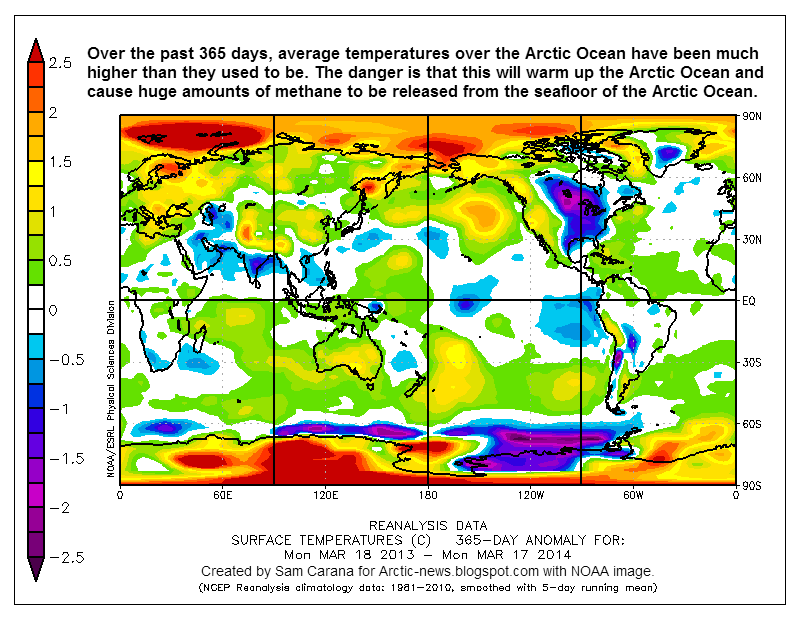 The image below shows more recent methane readings, around March 8, 2014. The image below is a Naval Research Laboratory forecast of sea ice thickness for March 8, 2014, run on March 3, 2014. 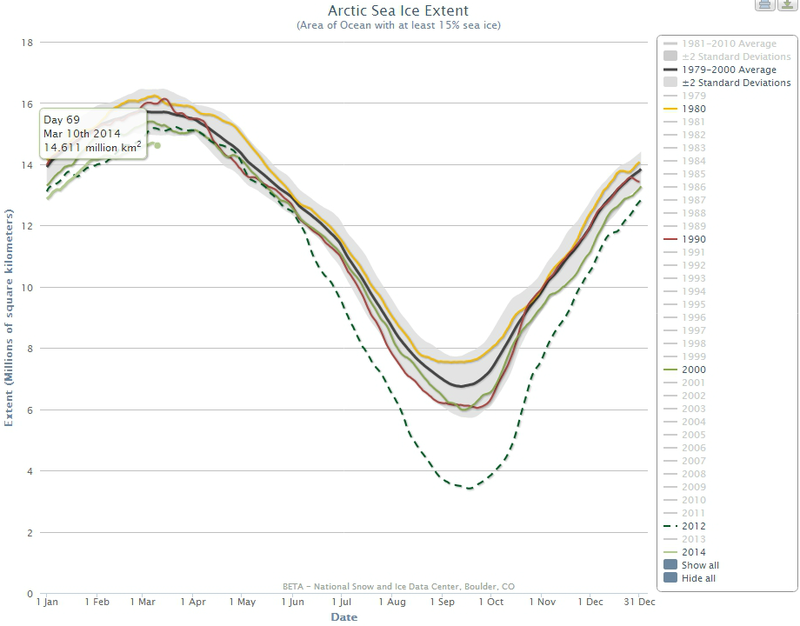 Meanwhile, the sea ice is close to record lows (for the time of the year), as illustrated by the images below. 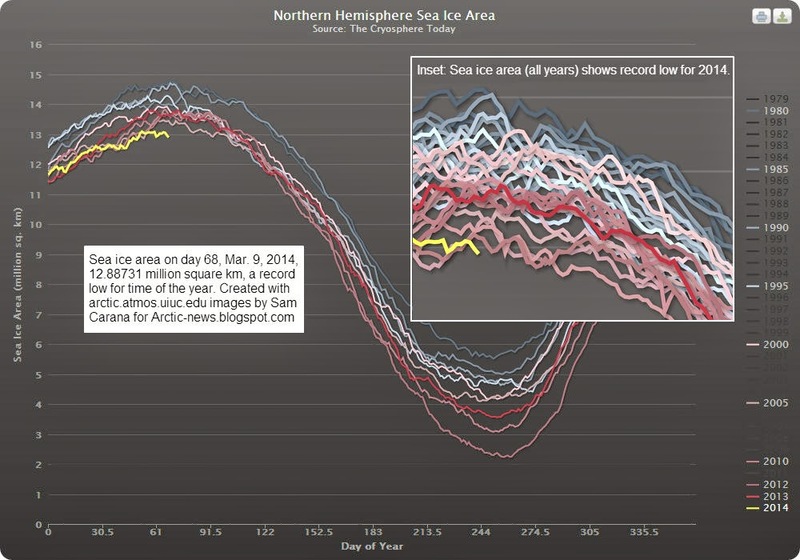 The image directly below shows sea ice area. 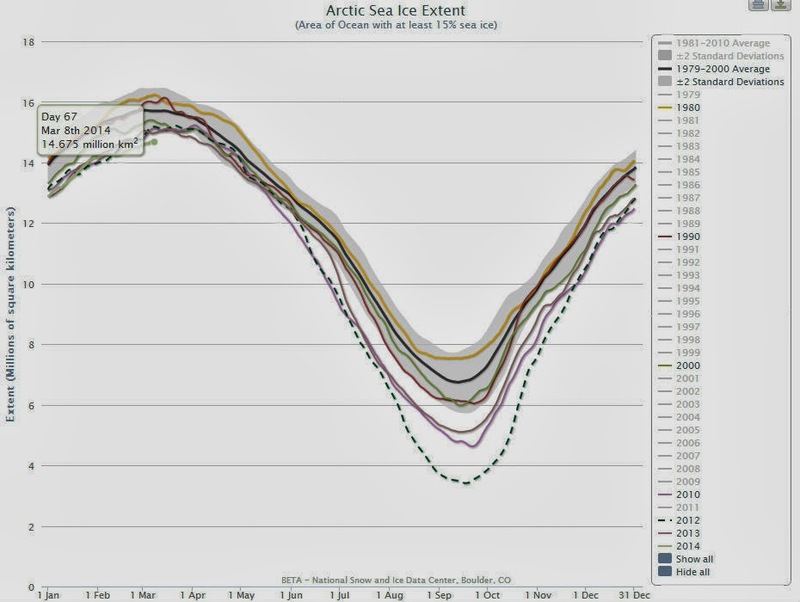 The image below shows sea ice extent. 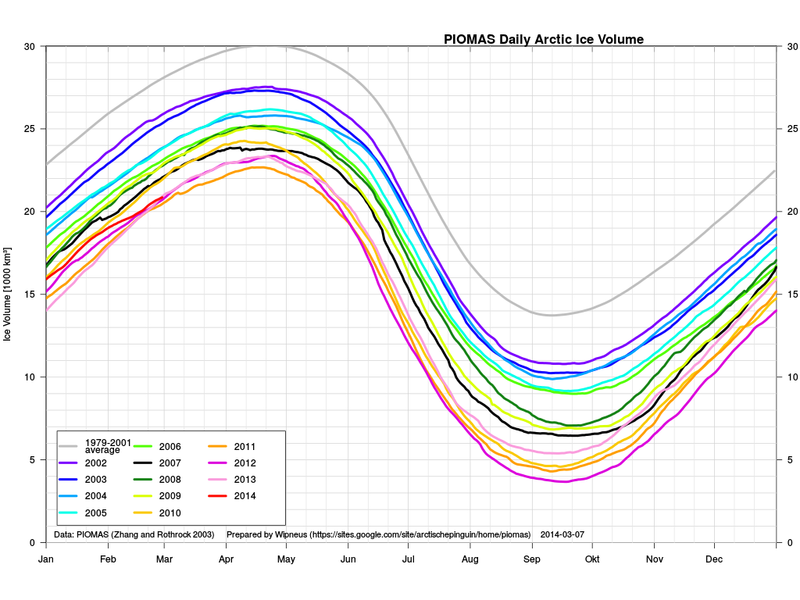 The image below, by Wipneus, shows sea ice volume. 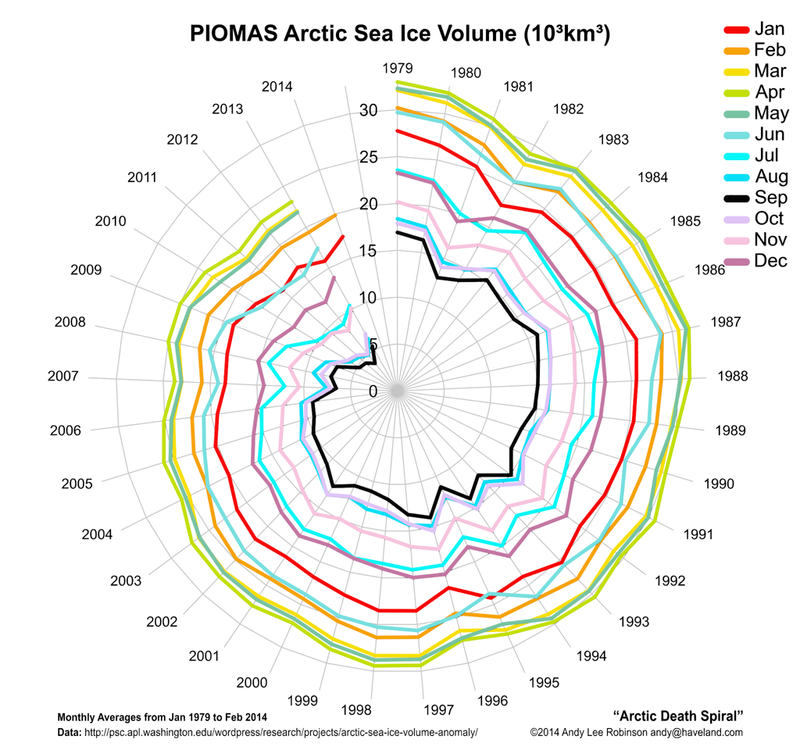 The image below, by Andy Lee Robinson, offers a different way of looking at sea ice volume, the Arctic Death Spiral. 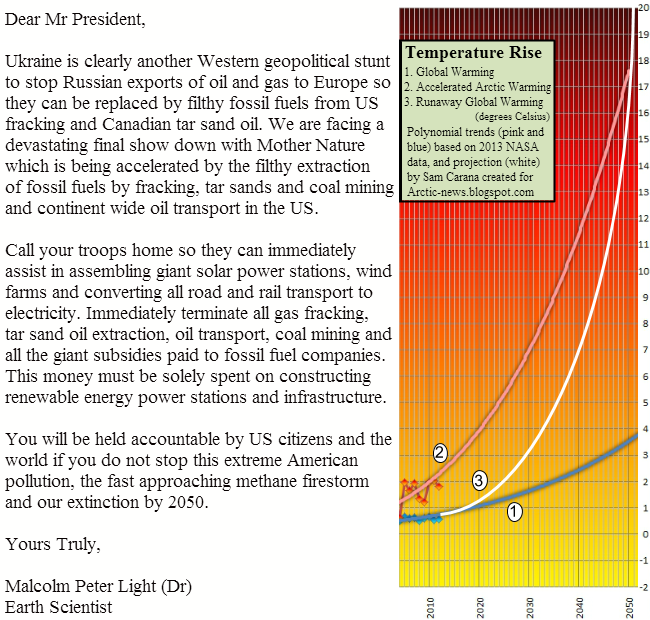 Ukraine is clearly another Western geopolitical stunt to stop Russian exports of oil and gas to Europe so they can be replaced by filthy fossil fuels from US fracking and Canadian tar sand oil. We are facing a devastating final show down with Mother Nature which is being accelerated by the filthy extraction of fossil fuels by fracking, tar sands and coal mining and continent wide oil transport in the US. Call your troops home so they can immediately assist in assembling giant solar power stations, wind farms and converting all road and rail transport to electricity. Immediately terminate all gas fracking, tar sand oil extraction, oil transport, coal mining and all the giant subsidies paid to fossil fuel companies. This money must be solely spent on constructing renewable energy power stations and infrastructure. You will be held accountable by US citizens and the world if you do not stop this extreme American pollution, the fast approaching methane firestorm and our extinction by 2050. Presentation by Guy McPherson, February 2014, Traditions Cafe, Olympia WA.